You might want to get up to speed with Blu-ray first and read a little introduction about what Blu-ray disks are and where the standard comes from. Adding a Blu-ray burner to your Mac Pro can be done cheap, fast and easy. I don’t understand why people make such a big deal out of this or why Apple doesn’t sell them. Update: It’s hard to find info about what models are supported. 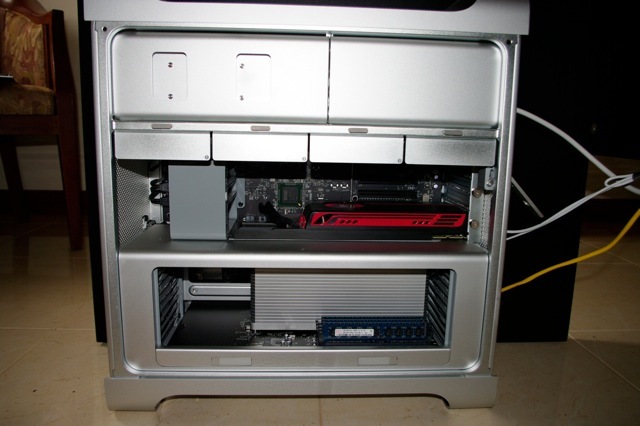 So far, I have received mails from people claiming successfully building the BH10LS30 in Mac Pro models from 1.1 (week 32, 2006) to the Mac Pro 2010 models. So I think it’s safe to say Blu-ray works with all Mac Pro models, at least in this time-line. The Mac Pro so far works with ‘any compatible model’ but that is the problem: Several blu-ray burner models don’t work with OS X. For example, the LG WH10LS30 is not fully compatible with all Mac Pro models (it works with the Mac Pro 5.1 mid 2010 model though). I used an LG BH10LS30, but Amazon no longer sells them. This how-to should work with just about any compatible model aftermarket internal drive, but I would Google the exact type before you order it. WH16NS40 (128 GB max., quad-layer). Some drives are compatible with Millenniata’s M-DISC’s, that claims that their discs last longer, though require a more powerful laser because of the material they use. However, according to the French National Laboratory of Metrology and Testing, M-DISC’s showed similar deterioration in quality as other (inorganic) DVD disks in their test. First you need a drive. Just make sure you order one that works with your machine. This can be a problem, because for example even the national LG support desk had no information at all in their system about how compatible their drives are with Macs and OS X. (Seriously… don’t they want to sell drives?! 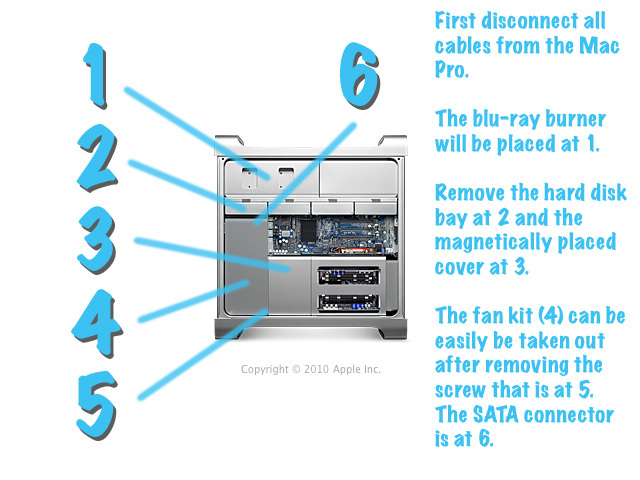 Mac Pro users want Blu-ray burners! That’s why I wrote this article.) Please mail me if you know about other drives that are compatible (or incompatible!). Take off the plastic front bezel of the drive, before trying to fit it in your Mac, else the tray won’t fit through the opening of the case of the Mac Pro. I’m not sure every drive model out there has a bezel that you need to take off, but so far every drive I’ve seen did. Shut down your Mac Pro, disconnect it, take of the side panel and ground yourself to the metal body (hard to miss anyway). There is a second, empty drive bay in every Mac Pro you can easily fasten a second, standard size disk drive in, like a Blu-ray disk burner. There is a black, 4-pins connector ‘hidden’ in the back that you can use for power. Then take out the screw on the bottom of the fan holder and be carefull not to drop it in the innerds of the Mac Pro. Take out the fan holder, it will slide out without resistance (in contrary to the older G5 models). If not, you forgot the screw 😉 Also, apparently there are also Mac Pro models that have two screws, so it it’s still stuck, go hunt for the second one. Lead the SATA cable from the top thourgh the gap on the opposing side / bottom of the top compartment down to the motherboard and plug it in one of the two connectors. Several people write about how hard it is to connect the SATA cable to the Mac Pro and they often talk about 90 degrees bended SATA connectors and all kinds of other, less efficient ways to connect the drive. Because LG Netherlands said it would come without a SATA cable, I had already ordered a SATA cable elsewhere with a 90 degree bent connector specially for it, but the had send me a shorter version and it turned out to be to short (only by a centimeter or two..). However, it came with a plain SATA cable and it fits fine. I ‘pre-bended’ the cable somewhat, just at the end, before connecting it, because I didn’t want to put any force on the motherboard. Put in your new Blu-ray burner. There are some cool, more solid shaped screws in the side of the empty tray of the Mac Pro, I used them instead of the more common looking screws that came with the blu-ray burner. Connect it to the sata cable and 4-pins power connector. Put everything back together and reconnect your Mac Pro. It came with a Blu-ray disk recordable— a “BD-R” — of 25 GB and I used Toast Titanium to burn a 23.5 GB backup in.. well I didn’t time it, but it was about 8 minutes, without verifying. Much faster than I had expected. (I took that photo with my iPhone instead of screendumping it, that’s why it’s kind of blurry). DiskCatalogMaker is a practical application to keep track of your files with on all those backup disks. It comes as a free bonus with Toast Titanium, although it’s not a product of Roxio. I know making small DVD backups are often the cheapest, but for about € 130 or ± $ 165 € 100 or ± $ 134, it’s worth it to add the option for making 25 GB and even 50 GB data backup disks. This is so much faster than burning a handfull of DVDs. Also, it’s the perfect way to backup movies without filling up your hard drive. Plus, it’s a nice solution if you want to watch a HD movie on your widescreen TV, specially if it’s not near your Mac. Until now, OS X 10.6.4 doesn’t support playing Blu-ray video disk though. This seems to be a political or financial issue at Apple, more than a technical obstacle. Expect this to be solved in the future. Just don’t hold your breath. The BH10LS30 supports LightScribe. This is a technique which lets you burn text and images on your disk instead of labelling it. It’s very appealing, but although you can buy both LightScribe CDs and DVDs, there are no BDs yet that you can LightScribe. (If you find them, please comment or mail me). It’s still for sale, but looking at their product line, it seems like the LG BH10LS30 will be discontinued in 2011. Ben McPeek writes he had to remove a second screw from the fan assembly before he could remove it. It was at the bottom, behind the aluminium hood. He bought the burner for about $95 (september 2010). Eventually he mounted it in a USB 2 external box (from OWC) that cost about $30. ‘Much better than lacie that runs around $400+‘. If you have any additions or corrections to this how-to, please comment or let me know, so I can adjust it accordingly. Especially information about what model of Mac Pro is compatible with what drive is useful information to others. After reading this page (fantastically helpful – thanks Leon) eventually I just took the plunge, bought the BH10LS30 drive and followed (to some extent) the instructions above. I’ve now tried burning a data back-up and a Blu-Ray disc playable in a set-top player using Toast Titanium 10 with the BD-HD plug-in. While the video disc took a very long time to encode (it was a 100 minute film I shot), it did and both the video and data discs burned successfully to a Panasonic 2X BD-RE disc. The drive showed up straight away in the system profiler straight away and the eject menu on the top bar appeared, in case you don’t feel like using ALT+[EJECT] on the keyboard. I would add that I couldn’t remove the (magnetically attached?) covers at the bottom of the tower, behind the front fan. I tried just removing the top (grey plastic) fan assembly screw but there is obviously one at the base that’s inaccessible unless the aluminium cover is removed too. Since it seemed likely that I’d have to pull the graphics card out to get to the aluminium covers properly, I removed HDD bays 1 & 2, fed the SATA cable that comes with the drive down behind HDD bay 1 and the fan casing and (having removed just the top screw of the plastic fan casing), managed to pull the casing out by about 5mm – just enough to insert the pre-bent SATA plug into the top ODD SATA port on the motherbaord. Then it was a case of connecting the other end and power up to the drive, removing the LG face plate on the drive drawer, and putting the Mac back together. The fan assembly does push on the SATA connector and board slightly but short of removing the fan assembly and cutting part of it away there’s nothing you can do about this. Don’t waste any money on adaptors. You don’t need an IDE (PATA)/SATA adaptor or a Molex to SATA power adaptor, the latter of which I bought but which comes with the kit. I’m delighted and it took about 25 minutes to do. 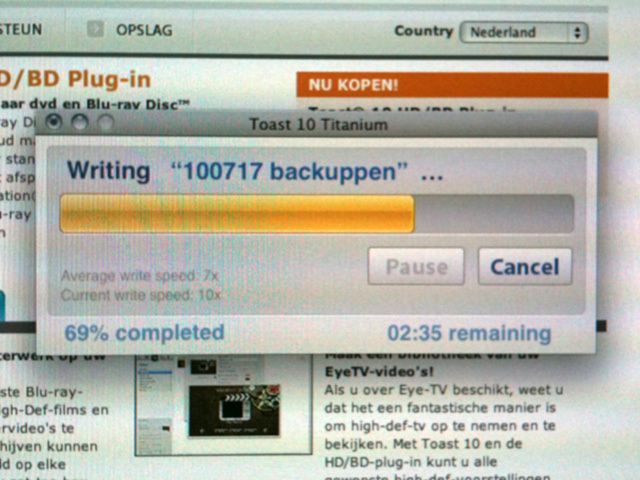 Can’t wait to start burning HD discs of my footage with FCP and DVDSP (yet to check this). Hope this helps anyone else with the same trepidation I had – go for it, you won’t regret it! …if i have 10.6.6, are you saying Blue Ray is not compatible? OS X allows for Blu-ray for years, so that’s not the problem. It’s the (seemingly) completely randomness of supported blu-ray drives that drives people nuts. For example, the LG BH10LS30 Blu-ray burner work fine while the LG WH10LS30 does not. Quote: (..) the LG BH10LS30 Blu-ray burner work fine while the LG WH10LS30 does not. This is nonsense. I ordered a LG WH10LS30 from OWC for my Mac Pro 5.1 (mid 2010) and it just works. Hell, they are a top-notch Mac vendor and they have this particular model (WH etc.) on sale for the Mac Pro. I found out on LG’s website, the BH model is a discontinued model, while the WH is current. Please do some research before shouting random comments, no offend. A Mac Pro 2008 is not equal to a Mac Pro 2010. The very reason why I wrote this article to begin with, is that was very hard to find useful information about which models of blu-ray burners work with which models of Mac Pro. Before I bought the BH10LS30, I called LG Netherlands (and even a few local vendors) in an attempt to find out whether it’s compatible with a Mac Pro early 2008. The only answer I got was that it was compatible with Windows, and they even suggested I’d look elsewhere. Although I tried to bring this under attention at LG by mail about a year ago, there is still not a word to be found about Mac Pro compatibility on, for example the site you link to. If you had done enough research yourself or at least RTFA before commenting, you might have known this. On the other hand I think it’s very interesting to know the LG WH10LS30 works so well with the Mac Pro 5.1 mid 2010. However, this is not proof that it will work with other Mac Pro models, future or past. Please post here if you know more working / non-working combinations! I didn’t need any of their software anyway. I also needed a Molex – SATA cable. This might interest some other Mac Pro 2008 users. You mean for powering the drive? There already is a free molex cable in all Mac Pro models. It’s tucked away tightly so it’s easily overlooked, but you can find it by following the black molex cable that feeds the drive in the top compartment.